Kindness is a very important lesson to learn for kids early on in life. And what better way to help them learn kindness than with the cartoon characters they already know and love! Nickelodeon’s newest DVD, Let’s Learn: Kindness sets out to teach some of life’s biggest lessons including good manners and forgiveness. 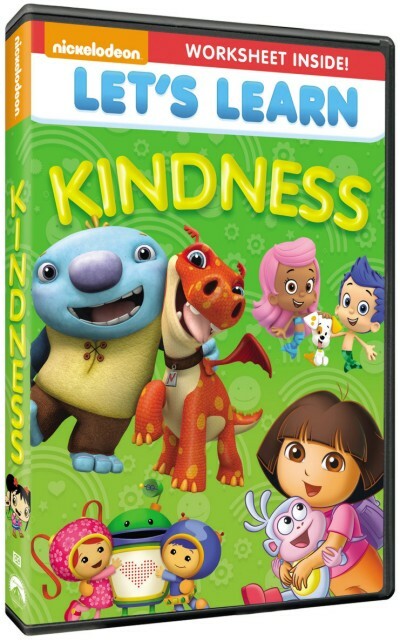 This delightful DVD features six super-polite episodes of Nickelodeon’s popular franchises Wallykazam!, Bubble Guppies, Dora the Explorer,Team Umizoomi Blue’s Clues and Ni Hao, Kai-lan as the characters learn the values of friendship, manners, teamwork and more! With over 140 minutes of social-skills fun plus a bonus educational worksheet for on-the-go learning, Let’s Learn: Kindness is a must-have for every growing and loving child. Wallykazam! – “Totally Swamped” – Wally’s grumpy neighbor, Stan of the Swamp, won’t give back his new glider unless Wally can make him laugh– a real challenge since Wally has never even seen Stan smile! Can Wally use his magic stick to make “M” words that’ll get a chuckle out of the swamp monster? Bubble Guppies – “The Glitter Games!” – Molly helps Demanda, an aspiring princess, with her manners. Together they’ll become true princesses in the hallowed Glitter Games! Dora the Explorer– “Por Favor!” – Dora and Boots read a fairytale about a young kinkajou, a cute and cuddly forest creature, who is destined to be king. The kinkajou loses his crown because he doesn't know the magic words "por favor." Dora and Boots set off to teach the kinkajou the magic words. Along the way, they encounter knights, dragons and talking drawbridges. Team Umizoomi– “Stolen Lunches!” – The team is visiting their friend’s school when The TroubleMakers steal all the kids' lunches! Milli, Geo and Bot take off in hot pursuit to get the lunches back before The TroubleMakers reach their secret picnic spot. Blue’s Clues– “Blue’s Sad Day” – Something is making Blue sad, so we play Blue’s Clues to figure out what it is. Along the way, we help our Felt Friends label their feelings and skidoo into Blue’s school to help her classmates figure out how to resolve difficult situations and emotions. Ni Hao, Kai Lan– “Kai-Lan’s Carnival” – Kai-Lan and her friends wake up early today because there’s a carnival in the backyard with game booths, prizes and rides! Stompy the elephant is almost finished building a Rollercoaster Rocket Ride that everyone wants to ride. When Rintoo and Hoho throw some balls at another game booth, they accidentally break Stompy’s rocket. It’s up to Kai-Lan and the viewer to help Rintoo and Hoho realize that if they cause a problem for someone else, they need to say sorry and help to fix it. This looks like something my nieces would really enjoy watching!